Aigah and Bishop Chapman. Photo-Art Babych. 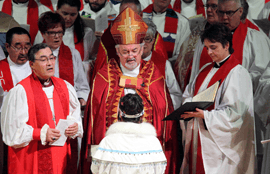 On Nov. 10, Aigah Attagutsiak was ordained to the diaconate at Ottawa’s Christ Church Anglican Cathedral. This event was an answer to “over 30 years of prayer” for the Rev. Roger Briggs. Briggs is Chaplain to the Inuit congregation meeting at St. Margaret’s Vanier in Ottawa and has been closely involved in Deacon Aigah’s theological training and preparation for ordination. 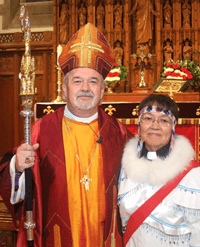 Deacon Aigah, who moved to Ottawa from Arctic Bay in 1998, is the first Inuk to be ordained in a Southern diocese. Both her ordination and the congregation she will help to lead are the fruit of a long-term partnership between the Dioceses of Ottawa and the Arctic. That partnership has taken different forms over the years and at present is an informal one. However, the ties are strong and the congregation continues to grow. Briggs, who spent much of his 50-year ministry in the Arctic, says the congregation was formed to serve Ottawa’s Inuit population, which has seen major growth since the 1960s with Inuit coming south for education, medical care or employment. “The folk to whom we once went are now come amongst us,” says Briggs. Doubtless this congregational fragility mirrors the fragility of a culture that has undergone an incredibly compressed cultural transition. Briggs, as much a spiritual companion as he is a guide, says, “When you look at their history and what they’ve survived under and will survive…but they have a wilderness to go through and we cannot, cannot leave them in that wilderness,” he says. On Sunday mornings, the congregation meets for the Inuktitut service followed by tea and bannock. And Deacon Aigah will be there, continuing the leadership and care that has made St. Margaret’s Vanier a true spiritual home for Inuit Anglicans in Ottawa.